At Independence Manor, we pride ourselves in our home-like environment. We work to keep our residents on a similar routine to their lifestyle before admission, allowing them to choose and maintain their life preferences. If you’ve had a fall, stroke, hip/knee replacement or heart attack ( or live with a chronic illness), you know how important 24-hour care can be. Skilled nursing has long been the gold standard for high-quality health care services. Regain strength and mobility through customized therapies and wellness programs. Work with knowledgeable, friendly staff who go the extra mile when assisting with activities of daily living. Be a part of a warm, welcoming community. Here at Independence Manor, we offer much more than a place to stay — we offer a place to live well. 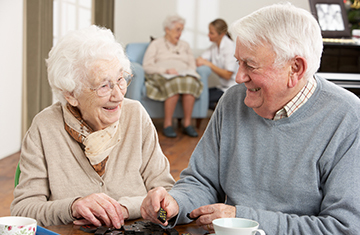 Our residents share some common values: to be recognized as individuals, to lead lives with a sense of purpose, and to maintain connections with people and interests that are meaningful to them. Because we’re passionate about enabling those values, we are constantly innovating new and better ways of enriching the lives of our senior living residents. To learn more about Independence Manor Care Center, contact us today! Most rooms have new electric high/low beds. Private phones are provided for our short-term rehab units. The full in-house rehab unit provides PT, OT, ST.
Wi-Fi internet service is available. All rooms are equipped with dish (satellite) hookups.